We can transfer these digital 8 track multitrack audio tapes in the digital or analogue domain into a range of delivery formats suitable for all modern Digital Audio Workstations. 16 or 24 bit recordings in standard or High Resolution (HR) mode, 48kHz, 96kHz or 192kHz can all be migrated to files. Direct digital transfers using Tascam’s proprietory TDIF digital interface. No unnecessary DA and AD processing for these ‘born digital’ recordings. The Tascam DTRS format is an 8 track digital multitrack audio recording system using 8mm tapes, originally developed for video recording. The helical scan design similar to RDAT has the 8mm tape wrapped around a high speed spinning head drum. Any physical problems with the tape will give problems with this format. Tape based digital formats like these are arguably more at threat even though much newer than older analogue formats. They will also be much harder to restore and recover when degraded. It is highly recommended to transfer these tapes to a file based digital format such as .WAV or BWAV now. The machines, while popular have fragile tape transports which can often develop ‘tape chewing’ problems. Never load a valuable, un transferred master tape into a machine with an unknown history, it’s asking for trouble! The DTRS (Digital Tape Recording System) series of professional multitrack audio recorders were first introduced in 1993 by TASCAM. 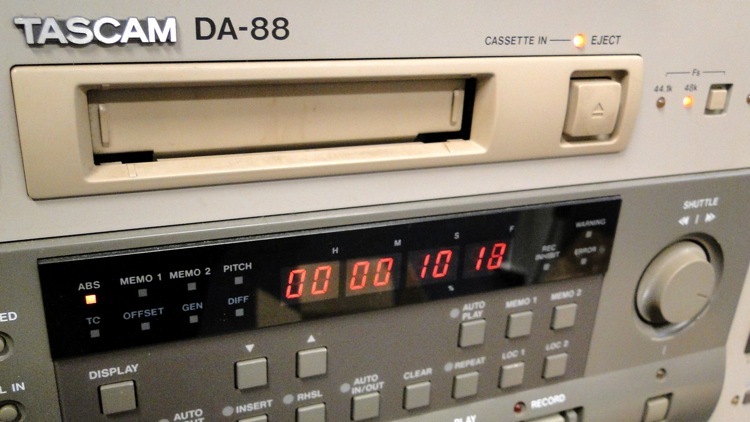 They used Hi-8 tapes to record digital audio in the DTRS format which allowed up to 108 minutes of recording time on a single tape. There were two versions of DTRS, 16-bit and 24-bit, and we are equipped to handle transfers from both types of machine. In 1995 the he DA-88 won an EMMY award for technical achievement. In 2012 the DTRS format was officially discontinued. It is still used in a few video post-production and remote recording environments, but music-only recording studios have moved on to hard drive recorders and Digital Audio Workstations (DAWs).